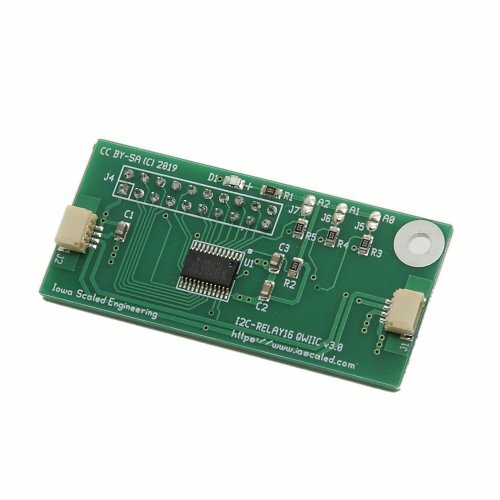 The I2C-RELAY16-QWIIC is a Qwiic-compatible relay driver board designed to piggyback on commonly available, Chinese-made boards with 16 SPDT relays. (We don't sell the relay boards directly, but they're available from multiple sources - various vendors on Amazon (#1, #2), SainSmart, or even direct from China on eBay.) It's a sister product to our I2C-RELAY16, except with handy Qwiic connectors rather than our usual 5V 6p6c I2C connection. 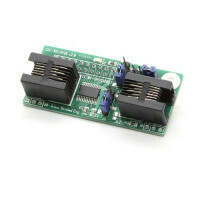 Included are two Qwiic-compatible I2C connectors, a female 20-pin dual row connector to attach to the relay board's header, a PCA9671 16 channel I2C I/O expander, and three address solder jumpers to select 1 of 8 possible addresses. The Qwiic connectors make it easy to connect to a whole ecosystem of other I2C boards. Have a Raspberry Pi and need a bunch of output relays? This is your board!